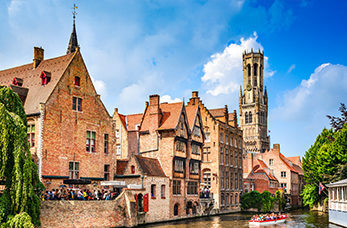 Zeebrugge is a village on the coast of Belgium and its your gateway to Brussels, a delightful little city full of old world charm with an abundance of canals and bridges, baroque architecture, cobbled lanes and one of the finest squares in Europe. Climb the 366 steps to the top of the medieval belfry that stands at 270 feet high for magnificent views over Bruges and the surrounding area. Built around 1225, this imposing Bruges landmark is famous for its soaring brick tower, 122 metres high. It's famous for housing Michelangelo's white marble sculpture of the "Madonna with Child." Learn about the history of cocoa from how the Mayans and Aztecs cultivated cocoa to the finished product. Watch a chocolatier at work and of course tasting is included in the visit. Historically the Grand Place was a market place for trading food. It's one of the most beautiful squares in Europe with architecture from three different eras, today it's a meeting place for locals and tourists alike.